Some time ago, I remember being able to find a delicious bottle of French wine for six dollars. Now the same wine, from the same winery, costs $20. Is it really over three times better than it was back then? Obviously not! It is just more expensive. Welcome to inflation. Rising prices erode purchasing power, making us poorer over time. Inflation becomes a huge concern for anyone who is retired or planning for retirement. Inflation is a fact of life. Averaging about 3.3% over the last 100 years, it was only negative in 13 of those years. While we are working, we may not notice this as much since our income also tends to rise over time. It is when we hit retirement that the whole concept becomes much more tangible. Our income becomes “fixed” because we no longer have increasing wages to offset rising prices. In addition, the cost of many services needed by older adults, especially health care, increases faster than the rate of inflation. The hypothetical graph below shows prices (or your expenses, the dotted line) growing at 3% per year for 25 years. Income, the solid line, grows at just 1 percent per year. 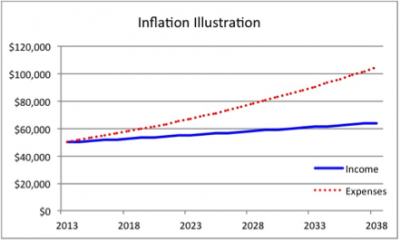 Cost of living adjustments to Social Security do not keep pace with inflation. Notice that each year the gap between expenses and income increases. The longer we live, the bigger this problem becomes! Inflation seems to be an unstoppable force that threatens our standard of living. Back to that $6 bottle of wine – I have to confess that was about 30 years ago. The price of that wine has risen just over 4% a year since then. Imagine retiring today; then another 30 years go by. That bottle of wine could cost almost $67, assuming the rate of inflation remains the same. Pretty sobering! Even a modest increase in prices over a long period of time really affects what we can afford. Now retirees are facing a double-edged sword: rising prices and low interest rates on savings accounts and bonds. Ouch! In the past, many people got by on interest from savings and Social Security. With bond yields so low now, it is difficult to generate much income in a safe or low-risk way. Even with bonds, the only way to generate higher levels of income is to assume greater risk. So, what does a person do when retired or planning for retirement? This situation highlights the need for additional savings and investments in the years prior to retirement. One of the best ways to solve the problem of the widening gap between income and expenses is to own assets that appreciate over time. Real estate and a diversified portfolio of stocks and bonds have the potential to appreciate at rates in excess of inflation. But they need time to work for you. Investing isn’t about flipping houses or wading into the hot areas of the stock market. It is about consistently putting money away and taking just the amount of risk necessary to reach your goals. For those already retired, look at your bond/fixed income investments with a keen eye on the risk. Perhaps out of economic necessity you’ve had to put money toward risky investments to raise your monthly income, but beware that this doesn’t come back to bite you.